BrainPOP ELL is BrainPOP’s comprehensive English language learning program, taking students from beginner level to advanced. It features animated movies that model conversational English while seamlessly introducing grammar concepts and vocabulary words. Accompanying the movies are a range of features designed to underscore the movie’s lessons, including Flash Words (interactive vocabulary flash cards); Word Play (enrichment vocabulary activity); Read It (reading comprehension passages and quiz); Write It (guided writing); Play It (games that reinforce the movie’s grammar); Hear It, Say It (pronunciation exercise); and a game-like quiz. Based on everyday social situations and including academic content, the leveled movies and their supporting features build upon each other while giving students the confidence they need to communicate in English. An online placement test assesses students’ respective language skills to identify where in the linear program they should begin. 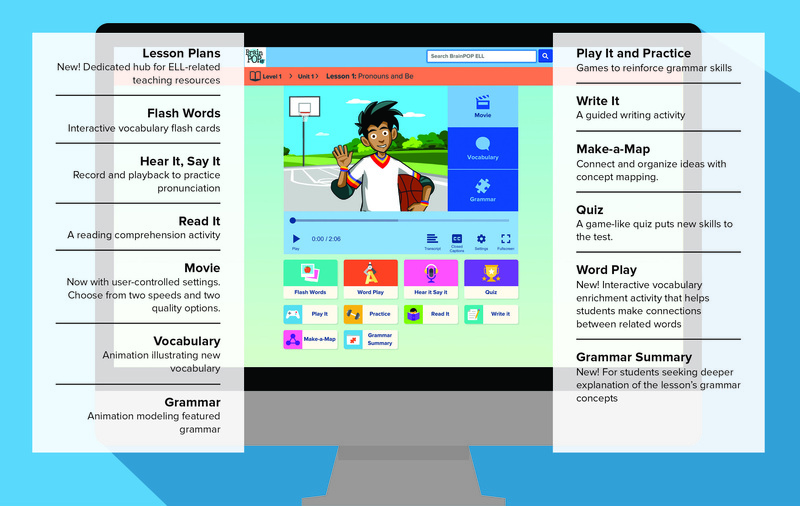 Learn more below: view the materials we’ve put together to help you get to know BrainPOP ELL and its features. New to BrainPOP ELL? Check out this easy to read "getting started guide" to learn how to use BrainPOP ELL and all its features. You'll be a pro in no time. Make-a-Map is BrainPOP ELL’s concept mapping tool powered by IdeaphoraⓇ. Transform information into knowledge by making meaningful connections between their thoughts and ideas using BrainPOP ELL resources. This collection of short tutorial videos and detailed printable instruction guides will help you get up and running with My BrainPOP. Track of students' work, provide feedback, create custom assessments, and more! Watch this quick tour video highlighting many features that make BrainPOP ELL unique! An assortment of guides to help you make the most of BrainPOP.com's movies, interactive features, and creative tools.